Jim Alred is the New Media Director for News Publishing Company in Rome, Ga. He oversees internet operations for the company’s websites and directs the multimedia department. Before returning to his hometown of Rome, he was an online editor and online videographer at the Naples (Fla.) Daily News. In Rome, Alred and his crew have won awards from the Inland Press Association, Southern Newspaper Publisher Association and the Georgia Press Association for website and multimedia excellence. They produced the first-ever newspaper productions to receive Southeast Regional Emmy Nominations. Alred began his career as sports editor for the Selma (Ala.) Times Journal after graduating from Auburn University. 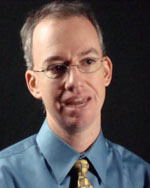 Jim Alred, new media director, The Rome News-Tribune, was a high school athlete in Rome, Ga., who came back to work at The News-Tribune in September 2006. He has added an expanded digital video dimension to The News-Tribune, “almost 3,000 videos since 2006,” according to Alred. For Alred, the News-Tribune’s mission is simple: “We cover Rome [Ga.] in perpetuity,” he says. Jim Alred, new media director, The Rome News-Tribune, says anyone aspiring to become a new media manager needs to “learn everything you can.” He credits his work at the campus radio and TV stations at Auburn University for expanding his multi-media skills. Seek to “have multiple internships,” says Alred.